Heeeeeeeeere come the Gators, is just one of the many traditions found at Ben Hill Griffin Stadium, nicknamed “the swamp” and located on the campus of the University of Florida. The history of the football program at the university began in 1906 when the team played at Fleming Field. As fan support grew, a new stadium was needed for the Gators by the 1920s. Florida President John Tigert led the effort to drive construction for a new facility. On April 16, 1930, construction on the stadium began and was completed by October 27, 1930. The following week, on November 8, 1930, Florida battled Alabama as Florida Field was dedicated. It originally had a seating capacity of 21,769 and its name, Florida Field, was in honor of servicemen who lost their lives in World War I. The original section of seating now encompasses the lower half of the current stadium. By 1950, the first of many additions to the stadium was in the works and by the start of the 1950 season, 10,000 bleachers were built on the west side. The Gators hosted their first night game at Florida Field on September 23, 1950. Fifteen years later, an additional 10,000 seats were added to the east side and bleachers were constructed on the south end zone bringing the capacity to 62,800. In 1971, the grass field was replaced with Astroturf, but two decades later the surface returned to grass. The south end zone with a skyboxes and a press box was completed, increasing the capacity of Florida Field to 72,000. In 1989, the stadium was named Ben Hill Griffin Stadium at Florida Field, after Ben Hill Griffin, a lifetime fan of the Gators and donor to the University of Florida. A $17 million addition in the north endzone increased the capacity to the stadium to 83,000 in 1991. Before the start of the 2003 season, a $50 million expansion of the press level was completed. This project expanded the press box, added 2,900 club seats and 34 luxury suites. 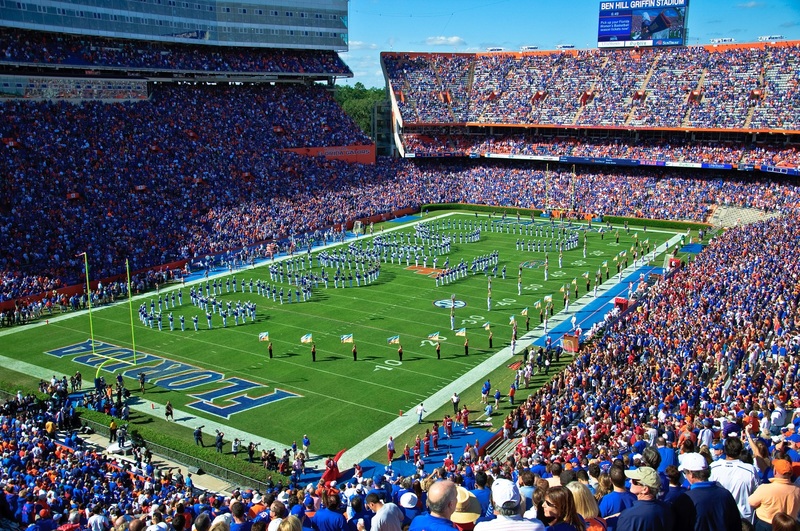 Ben Hill Griffin Stadium is now the largest stadium in the state of Florida with a capacity of just over 88,548. Various levels of seating enclose the playing field. New HD video/scoreboards were added in 2009 replacing the existing in the north and south endzones. Outside the stadium are three statues of Florida’s three Heisman Trophy Winners. Unveiled in April 2011, the statues are of Steve Spurrier, Tim Tebow and Danny Wuerffel. In June 2016 the univeristy renamed the field at the stadium, Steve Spurrier-Florida Field at Ben Hill Griffin Stadium after the winningest coach in program history. The Florida Gators have had years of success at Ben Hill Griffin Stadium, including a 30 game winning streak between 1994 and 1999. 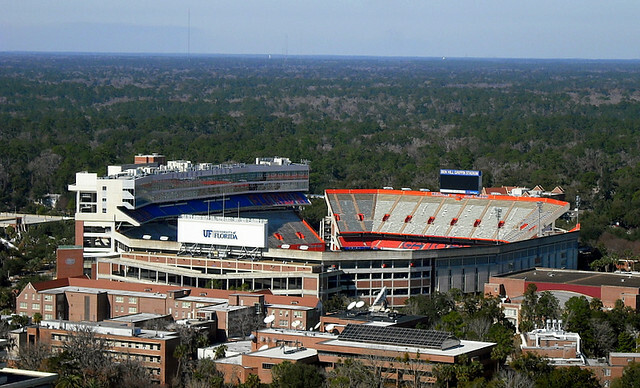 Ben Hill Griffin Stadium is one of the most formidable venues for opposing teams to play at, as the stadium is one of the loudest in the nation and the temperature on the field often reaches 100 degrees.